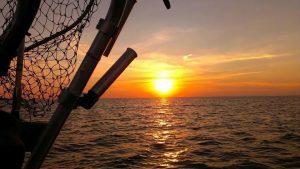 Thursday, July 26: Walleye fishing on Saginaw Bay has been hampered by strong winds that have made “walleye trolling speed” almost impossible. Yesterday, the morning started off well weatherwise, but by 1100 hrs. the waves were either going over the In-line Offshore Boards or making them jump a foot in the air. Our big 31Tiara was going downwind at 1.4 mph without the engines running! 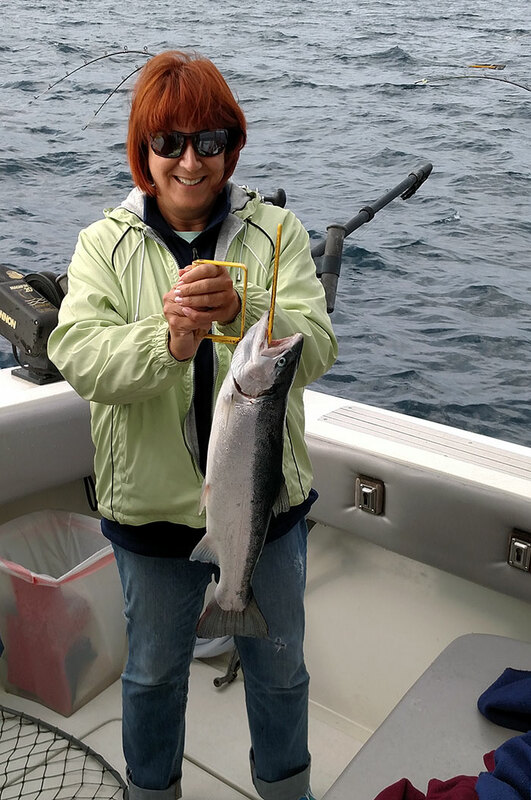 No problem for salmon fishing but NOT good for walleye trolling so we called it a day early. Today is another “blow day” so we wisely stayed ashore. The GOOD NEWS is the walleye are staying in the bay this year, as we have had the right wind directions to keep colder water down in the bay. Tuesday, the fishing was excellent from south of Pt. Augres all the way down to west of Bouys One and Two at the shipping lane to the Saginaw River. Some anglers were doing very well on Hot ‘N Tots but the majority were pulling crawler harnesses. Once this weather settles back down, look for the fishing to get right back on track again. Until next time, keep the rod tips up and don’t give ’em any slack!.